Read about the top four Bitcoin IRA companies and information on the different types of cryptocurrency. BlockMint offers experienced guidance and secure, easy-to-use tools that make the process of setting up a Cryptocurrency IRA easier. The minimum investment is $10,000. BlockMint works with a variety of digital coin offerings. Coin IRA is a facilitator company, meaning they are not an exchange, bank, custodian, or wallet themselves but they handle the communication between these entities and the investor. Coin IRA is good for those new to cryptocurrency. Bitcoin IRA is a firm that works as a hub to connect investors, exchanges, digital wallets, and IRA custodians. Bitcoin IRA does not directly provide any of these services, however, they do facilitate the setup and transfer of funds to Kingdom Trust IRA accounts. BitIRA is a newcomer to watch from the Birch Gold Group team, and stands out for its commitment to security. What should you know about Bitcoin IRAs and other Cryptocurrencies IRAs? Cryptocurrency is a non-government-backed digital currency that relies entirely on the free market for its value. While some companies have issued their own tokens that represent the digital currency, these also have no backing other than the issuing company’s word, much like casino tokens. Because digital currency has no insurance or government endorsements such as FDIC or SIPC protection, and no national or international banking rate checks, some in the banking industry deem it to be a fraud. However, many others see cryptocurrency as the currency of the future where anonymous purchases fuel the free market. There is also a belief that the private companies brokering cryptocurrency transactions can do a better job of securing investments than the current system. The theory is that cryptocurrency can return the market to an equal playing field without governmental interference. However, this unregulated frontier is being seriously considered by some countries as needing regulation, and the US began taxing cryptocurrency gains in 2014 as property instead of currency. Be sure your cryptocurrency company and custodian can work together. Research cryptocurrency thoroughly and be sure your portfolio balances the risk associated with a new investment type. Get a list of fees and services from each company you are considering before investing. We evaluated 12 cryptocurrency IRA companies to choose our top four picks. In our evaluations, we researched current cryptocurrency information, company age, procedures, and security. After careful consideration, we selected our best cryptocurrency IRA companies: BlockMint, Coin IRA, Bitcoin IRA and BitIRA. In this guide, we will discuss what cryptocurrency is, how to use it as an IRA asset, the options available to the consumer, and our reviews of our top three choices. We also include helpful FAQ and tips for consumers when considering cryptocurrency IRAs as part of their investment portfolio. Cryptocurrency is a relatively new form of investment, so here are some things to think about. What Is A Bitcoin IRA or Cryptocurrency IRA? A cryptocurrency IRA is a Self-Directed IRA that holds investments in cryptocurrency rather than cash or investments in precious metals, stocks, or bonds. IRS regulations do not explicitly allow cryptocurrency in an IRA. However, the Internal Revenue Code does not specify what Self-Directed plans can invest in, only non-allowed investments and transactions. Cryptocurrency brokers and custodians interpret cryptocurrency IRAs to be allowed as capital assets since the IRS doesn’t disallow them. While cryptocurrency was often purchased directly from a cryptocurrency company when it first appeared on the markets, it is no longer common to make this type of transaction due to the complexity of the computing behind the currencies. Now, the most common way to purchase cryptocurrency is through a private exchange. 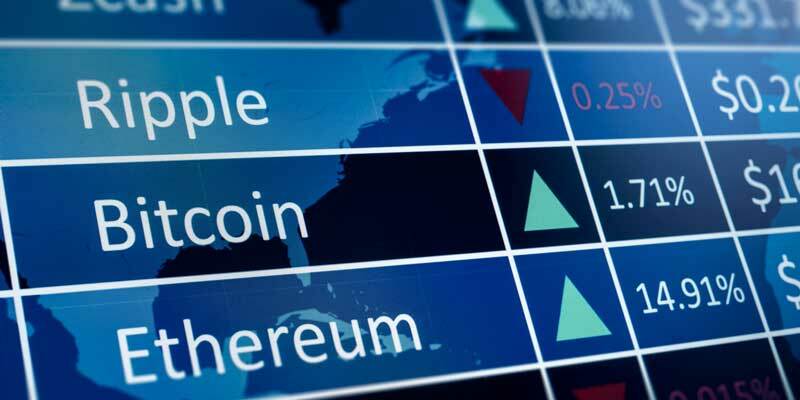 A cryptocurrency exchange is a virtual stock market where cryptocurrency from several companies is the only investment offered. Matching orders are put together between bidders and sellers by a cryptocurrency broker. Because exchanges are privately held and not regulated, prices can vary significantly between exchanges and brokers. Some cryptocurrency IRA facilitators run a private peer-to-peer cryptocurrency system and require customers to use that system while others shop between multiple open exchanges. Read more on how to buy bitcoin. Bitcoin is the largest and most well-known cryptocurrency currently in use. In 2008, the reclusive programmer, Satoshi Nakamoto, introduced the original coding and concepts. In 2009 he put the software out into the digital world and individuals have worked with the system since then, growing it into a global phenomenon based on a system of decentralized servers. There are no regulations or company rules to force worldwide users to adopt changes, and discussion of the code occurs on Bitcoin’s website. Bitcoin is currently the highest valued cryptocurrency. Litecoin is a cryptocurrency that is nearly identical to Bitcoin regarding transfer and coding but is faster and cheaper. Like Bitcoin, Litecoin has a set limit on the number of Litecoins that can be released, but the number is higher compared to Bitcoin, at 84 million. The code and process differences of Litecoin make it up to four times faster than Bitcoin, and it carries lower transaction fees. Ethereum, while still decentralized, has a more corporate beginning than other cryptocurrencies. Developed in 2014 by the Ethereum Foundation in Switzerland, Ethereum is designed to be more than cryptocurrency. The software has the potential for being a platform for transferring anything of value, such as property or content. Ethereum supplies a software wallet rather than relying purely on third-party programmers for security and storage. The depth of Ethereum’s potential for being more than just another cryptocurrency has led some to believe it will outpace Bitcoin to become the new standard. Ripple is the corporate cryptocurrency, a contrast to other cryptocurrencies. Ripple has worldwide offices and markets itself to banks and other financial companies as a secure digital currency with lower fees. Unlike Bitcoin and Litecoin, Ripple released all of its maximum currency, 100 billion tokens, immediately. Ripple Labs holds 60 percent of the tokens, and there is no mining system. Recently there was a dive in Ripple pricing. What Are The Benefits Of A Bitcoin IRA or Cryptocurrency IRA? Just like any other traditional retirement account, cryptocurrency IRAs come with benefits. As long as your digital currency is being held in a cryptocurrency IRA, its growth is tax-deferred. Transactions are secured through multiple security features and confirmed by a peer-to-peer protocol on a blockchain network. Unlike other traditional retirement savings plans, your investments are opened to more than just stocks and mutual funds. Adaptive scaling of digital currency makes artificially inflating supply impossible. Big banking institutions can’t touch your digital investments. Select an IRA custodian (if your broker/facilitator does not require you use one of their specified custodians) and open a Self-Directed IRA account. Place orders via your broker/facilitator who will then complete transactions and coordinate your IRA wallet deposits with your custodian. After our evaluation, our top picks for cryptocurrency IRA companies are: BlockMint, Coin IRA, Bitcoin IRA & BitIRA. Each of these companies stood out from the rest in different ways. BlockMint is an offshoot of Lear Capital, a household name in Precious Metals IRAs for over 20 years. Working with a company known to be a trusted source for non-traditional IRAs makes BlockMint a good option for consumers that want to get into the world of cryptocurrencies. We found the BlockMint representatives to be both knowledgeable and patient with questions. They understand that this is a new investment opportunity, so consumers are bound to have questions. BlockMint offers experienced guidance and secure, easy-to-use tools that make the process of setting up a Cryptocurrency IRA easier. Their website has a lot of information like investor kits that completely explain their three-step process involved with setting up a cryptocurrency IRA. The BlockMint website features current industry news and up-to-date prices for the cryptocurrency consumers can select for investing. The minimum investment is $10,000 per type of coin (i.e. $10,000 in Bitcoin, $10,000 in Etherium). BlockMint charges a fee of 15 percent to purchase your cryptocurrency and provides discounts based on volume. New Direction IRA Services, as Custodian, charges two simple fees to securely maintain your cryptocurrency IRA. The storage fee is $200 per year. The administrative fee ranges from $450-725 per year based on account balance and number of cryptocurrencies. For more information, read our BlockMint review. Coin IRA is a subsidiary of Goldco, a Precious Metals IRA company recommended in our Best Gold IRA Guide. They are a facilitator company, meaning they are not an exchange, bank, custodian, or wallet themselves but they handle the communication between these entities and the investor. The customer needs only to call them to begin a transaction, and then Coin IRA manages the rest of the process. Screenshot: Coin IRA Offered Cryptocurrencies. Investors can purchase Bitcoin (BTC), Ethereum (ETH), Ethereum Classic (ETC), Ripple (XRP) and Litecoin (LTC) and Bitcoin Cash (BCH) through Coin IRA’s facilitation. The current minimum investment is $30,000. Coin IRA utilizes multiple open exchanges for purchases and partners with several wallets, storage, and custodian companies. Coin IRA has a very informative website containing bitcoin IRA rules, benefits, current cryptocurrency pricing and a resource section. 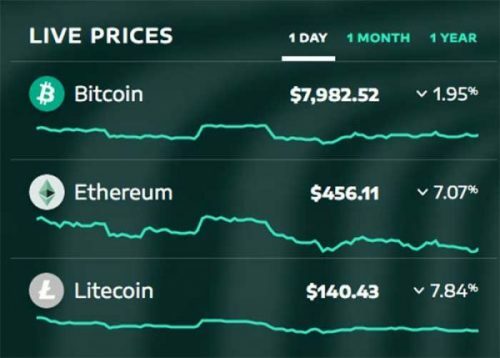 The resource page offers information about factors that affect the price of Bitcoin, real-time pricing charts for Bitcoin, Ethereum, Ripple and Litecoin, and a cryptocurrency news section. 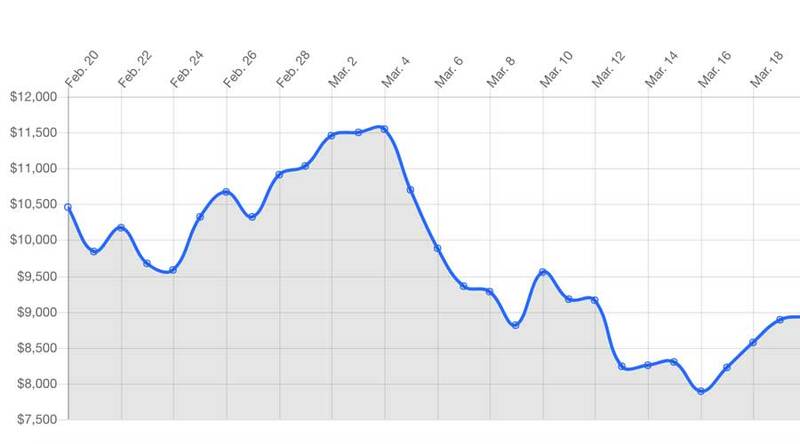 Screenshot: Bitcoin IRA Monthly Price Chart. Bitcoin IRA has a fee based on the amount invested, and Kingdom Trust IRA also has additional custodian and security fees. Investors can use Bitcoin IRA to process the purchase of Bitcoin (BTC), Ethereum (ETH), Ethereum Classic (ETC), Ripple (XRP) and Litecoin (LTC) and Bitcoin Cash (BCH). However, Bitcoin IRA must handle the purchases through their peer-to-peer network. Investors cannot purchase cryptocurrency through an open exchange or move previously-purchased cryptocurrency into their IRA account. Bitcoin IRA’s current minimum investment is $5,000. They offer a $1 Million Consumer Protection insurance policy with high-dollar insurer Lloyd’s of London, with protection from any internal cases of fraud or theft. Founded in 2017, BitIRA is a new venture from the Birch Gold Group team, which also manages precious metals IRAs. BitIRA is focused on security after the cryptocurrency transaction and claims to be “the World’s Most Secure Digital Currency IRA.” The company provides insurance on assets from any theft, fraud, mistakes or hacking. This insurance extends to cold stored (offline) cryptocurrency assets. They also attest that their systems and processes are compliant with Cryptocurrency Security Standards (CSS). BitIRA takes care of the investing process from start to finish. They manage the administrative duties that come with your cryptocurrency IRA, execute all purchases and sales and makes sure your investments are secure with encrypted software. Acting as your custodian, BitIRA gives you full control over the digital currency in your account but acts to carry out any directions you choose to do. Like other cryptocurrency IRA companies, BitIRA offers six forms of cryptocurrency asset transactions. These are Bitcoin (BTC), Ethereum (ETH), Ethereum Classic (ETC), Ripple (XRP) and Litecoin (LTC) and Bitcoin Cash (BCH). You’ll need a minimum of $20,000 to invest with BitIRA. The term for the storage for cryptocurrency is called a wallet, which is software that encrypts your account information and tracks your currencies. Some wallet companies are now providing self-contained hard drives, much like a thumb drive, that holds all of your account data and encryption. A bitcoin exchange is a virtual stock market where only bitcoins are bought and sold. It is a cryptocurrency exchange that supports the purchase of bitcoin with other types of cryptocurrency or value-based traditional currencies. How can I protect my cryptocurrency IRA? There are several easy ways to keep your account safe. Set up an email account to be used only for cryptocurrency transactions and use a very long password composed of letters, numbers, and punctuation. Don’t discuss cryptocurrency on social media to avoid hackers using information exchanged to get into your account. Finally, keep your cryptocurrency stored in a cold wallet – that is, offline until you are ready to buy or sell. A Self-Directed IRA is an IRA where the custodian does not limit your investment choices. IRA custodians, such as some banks or credit unions, offer only certain investments in stocks, bonds or mutual funds. A Self-Directed IRA is one where the investor takes complete control over choosing investments. However, a Self-Directed IRA also takes responsibility away from the custodian to explain tax implications and investment laws and leaves it up to the investor to understand all aspects of their IRA and investment choices. This type of IRA allows a much broader selection of investments, but the Security and Exchange Commission notes that it also comes with more risk because of the shift of responsibility for understanding information back onto the investor. A Self-Directed IRA must be managed by a custodian by law. An IRA custodian is an entity that is licensed and regulated by the IRS. The custodian could be a bank, credit union, trust, or another company called a non-bank custodian. Is cryptocurrency viewed as a retirement asset by the IRS? The IRS does not directly discuss cryptocurrency in Self-Directed IRA regulations. The only guidance on cryptocurrency is that it is taxable under property rules, which does not prohibit cryptocurrency as an IRA retirement account investment. How do I find a Self-Directed IRA custodian? Finding a Self-Directed IRA custodian can take some time as many of the banks and financial companies you may be familiar with do not handle this type of IRA. However, the first step in locating a Self-Directed IRA custodian is to ask your current custodian if they offer Self-Directed IRAs. If they do not, ask for a Self-Directed IRA custodian recommendation. The next step would be to get the current IRS-approved nonbank trustees and custodians list. From that list, you can contact approved custodians to inquire about their services, fees, securities, procedures, and other policies. Be aware that some cryptocurrency IRA companies only work with specific custodians so if you wish to work with a particular facilitator you will need to ask which custodians they partner with first. Bottom Line: Consumers should take time to understand the rewards and risks of cryptocurrency. Speak with companies you consider to see who can best explain the process and the different types of cryptocurrency in a way that is easy to understand. Because there is no regulation of security rules, fees charged, or transaction guarantees, finding a company with strong security policies and clear policies is very important. Our three best cryptocurrency IRA companies present solid options for balanced retirement investments with security features along with ease of transaction process.